Cetaceans (whales, dolphins, and porpoises) use sound to communicate, navigate, mate, and locate prey. But underwater noise from human sources-such as shipping, transportation, seismic exploration, and military sonar-has doubled in intensity every decade for the past 60 years, and this is having a negative impact on cetacean populations worldwide. 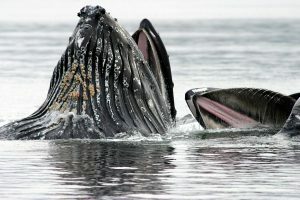 It may even be altering the singing behaviour of humpback whales. During the breeding season, sound is particularly important to humpback whales. Males produce long, complex “songs”, likely used in winter breeding grounds to attract females or convey status or position. Unfortunately, these low-frequency calls may be masked by shipping noise. A new study by Tsujii et al. (2018) in PLOS One found that shipping noise altered male humpback whales’ singing behaviour. Using a fixed hydrophone (essentially an underwater microphone), the researchers recorded sound production of the whales in the presence of a passenger-cargo ship in the Ogasawara Islands, 1000 km south of Tokyo. They found that fewer whales sang within 500 m of the ship in comparison to areas without ship presence. When the ship approached in close proximity, the main reaction of humpback whales was to stop singing completely. Humpbacks also reduced sound production after the ship passed. 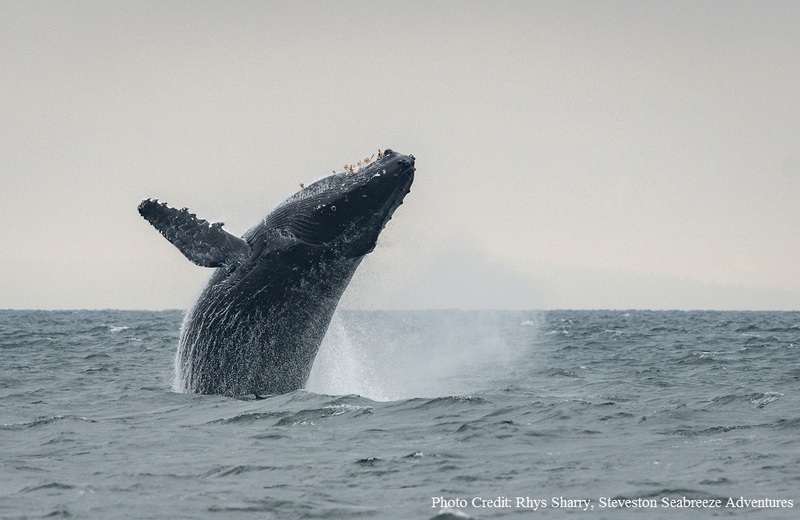 There is growing evidence that underwater noise affects more than just humpback communication. Avoidance behaviour, interruption of feeding and displacement from foraging areas, and changes in respiration and dive patterns have been noted in areas with high levels of underwater noise. Although further research is needed, these short term behavioural responses of individual humpbacks could have larger consequences on the population as a whole. Humpback whales lunging up through a school of herring. There is growing evidence that anthropogenic (human-caused) noise can interrupt feeding behavior and cause humpbacks to move away from foraging areas. In this study, the effect of shipping noise was easier to measure because of the remoteness of the island and the lack of vessel traffic. However, in many other areas, including the coastal waters of B.C., shipping, seismic exploration, military sonar, and transportation contribute to a very noisy environment. The culmination of all these activities can make the effect of vessel noise hard to isolate, but nonetheless impossible to ignore. This October 2018, the B.C. Cetacean Sightings Network launched the WhaleReport Alert System, an alert system that broadcasts pertinent details of whale presence to operators of large commercial vessels, tugs, and ferries. These alerts will inform commercial mariners of the presence of whales in their vicinity and will better enable vessels to undertake adaptive mitigation measures, such as slowing down or altering course to reduce underwater noise. WRAS cannot function effectively without regular, real-time observations reported to the B.C. Cetacean Sightings Network via the WhaleReport App. By reporting your cetacean sightings, you can contribute to conservation-based research and make our waters a safer place for these vulnerable animals. The WhaleReport Alert System (WRAS) has been developed to alert the operators of large commercial vessels, tugs, and ferries to the presence of whales so that they may reduce the risk of disturbance and collision. Hildebrand, J. (2009). Anthropogenic and natural sources of ambient noise in the ocean. Marine Ecological Progress Series, 395, 5-20.